An easy, pretty idea that doesn’t even really require a recipe. It’s also easy to use for themed parties or showers – just cut out a heart for bridal showers, a duck for baby showers or a turkey for Thanksgiving. (1) Make cupcakes in cupcake papers – whatever kind you like, though I’ve found chocolate works better. 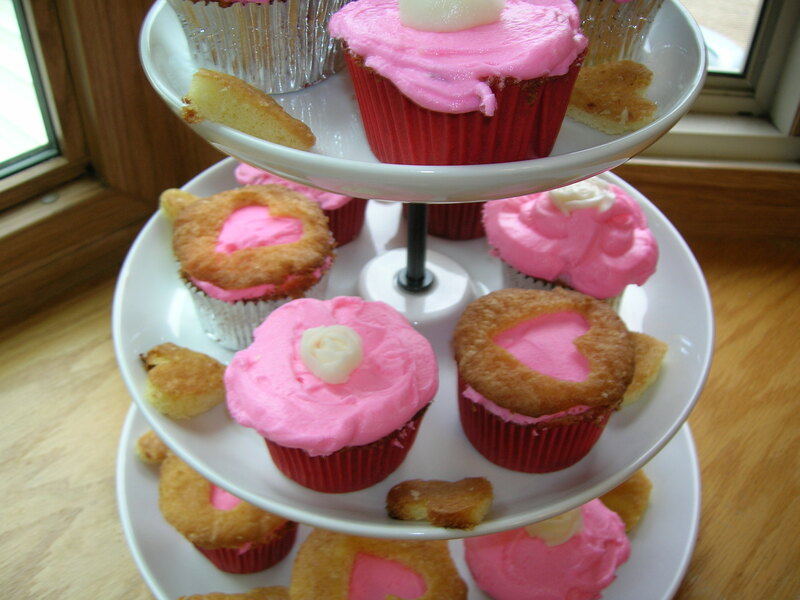 (2) Make or open some icing – a bright or contrasting color is most effective. (3) Cut the tops off the cupcakes, so that the top of the cupcake is level with the paper. Using a tiny cookie cutter, punch out your favorite shape in the top that you cut off. (4) Ice the cupcake, then put the top part that you cut off back on. Save the cut-out shapes – they make cute garnishes! 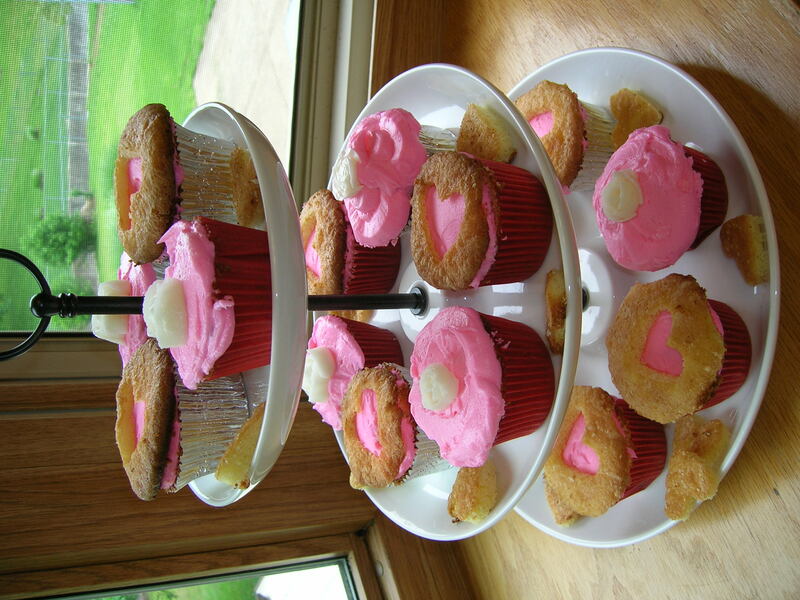 These were for a bridal shower, hence the pink hearts. One of my friends just got married, and we threw her a bridal shower. Instead of ordering a cake, I decided that I could handle designing, baking and decorating a pseudo wedding cake. 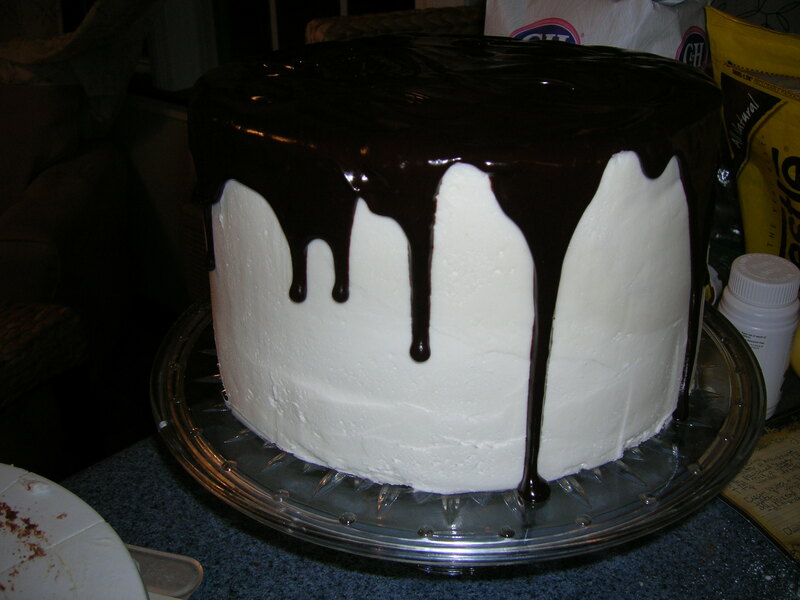 What I came up with was a four-layer chocolate pound cake, with both white butter cream icing and chocolate glaze. I also did some icing flowers (which I will not attempt to describe on a blog, unless there’s great demand). 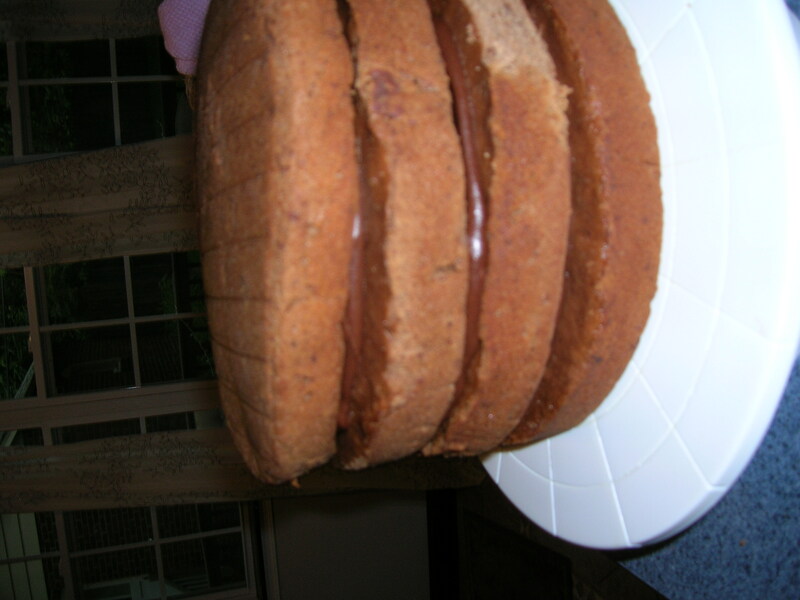 I doubled the cake recipe and tripled the white icing recipe. It fed 20 ladies with more than half to spare. Allow butter and eggs to stand at room temperate for 3o minutes. Grease (I use the flour spray) halfway up the sides of two 8- or 9-inch round cake pans, or a 10-inch tube pan. In a medium bowl, stir flour, unsweetened cocoa powder, baking powder and salt. Set pans and flour aside. In a very large mixing bowl, beat butter with an electic mixer on medium to high speed for about 30 seconds or until softened. Gradually add sugar, beating on medium to high speed about 10 minutes or until well combined. Add vanilla – I always add more than the recipe calls for. Add eggs, one at a time, beating on low to medium speed for 1 minute after each addition, scraping bowl often. Then, alternately add flour and milk, beating on low to medium speed just until combined. Fold in grated chocolate – which I believe I tripled. Pour batter into prepared pan(s). Bake in a 325 degree oven about 1 1/2 hours for the tube pan or 30 – 35 minutes for the cake pans, or until a toothpick inserted near the center comes out clean. Cook in pan on a wire rack for 10 – 15 minutes, then loosen sides of the cakes from the pan. Remove the cake from the pan and completely cool it/them. – Adapted from a copied recipe my sister-in-law gave me from a magazine, whose title isn’t on the copy. 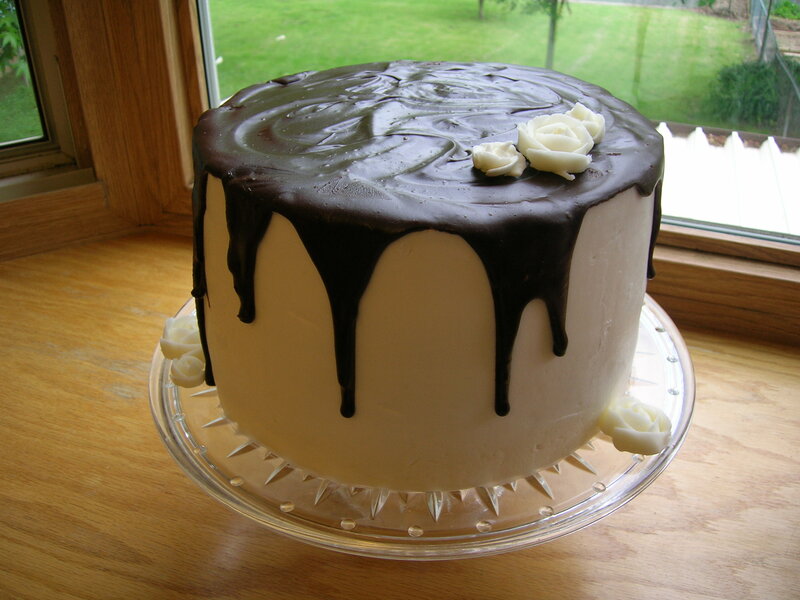 Cake decorating tip: Wrap your cake in plastic wrap after it’s fully cooled, and freeze it. Let it partially defrost and trim off any uneven edges or smooth the top while it’s still partially frozen. 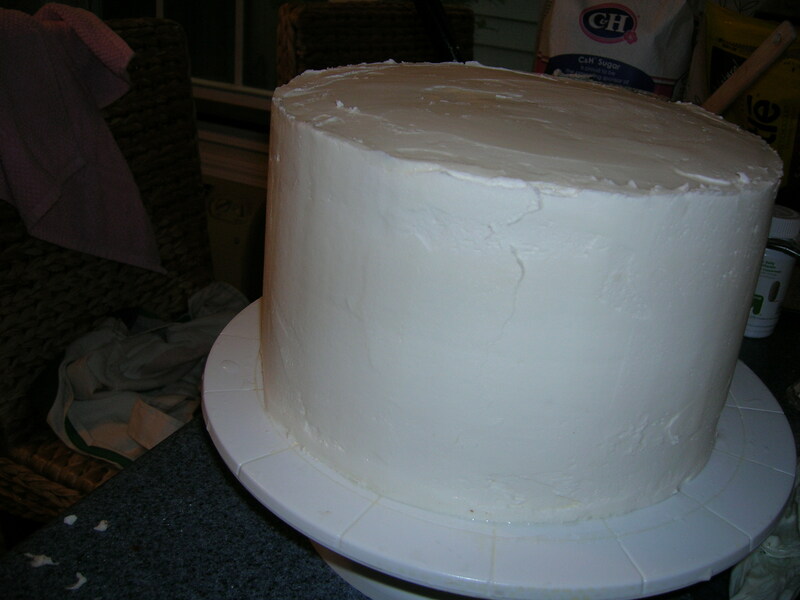 It cuts more cleanly and there are less crumbs to get into your icing. Stack your cakes with whatever icing you like in between the layers. Cream the butter and shortening. Add sugar, water and vanilla. Using an electric mixer, blend until creamy. Yield: 3 cups. 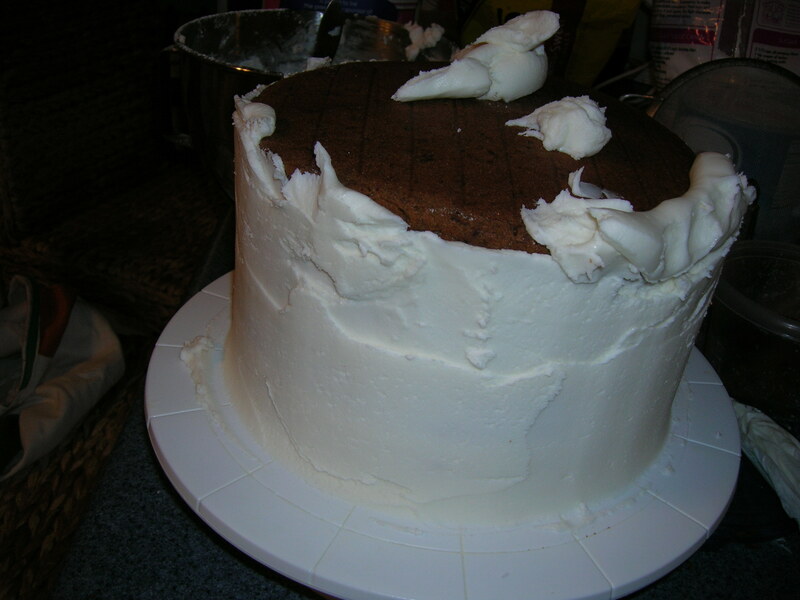 Smooth onto the sides and top of your cake. I ended up having to do a double layer of icing because you could still see the brown of the chocolate through one layer. Cake decorating tip: Using the right tools makes all the difference. Get an icing spreader that’s as tall as your cake, so you can do the sides in one swipe. 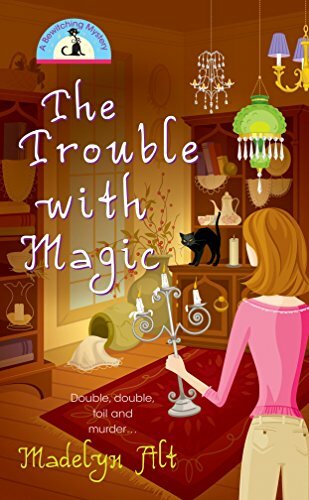 Melt the chocolate with your preferred method – I’m a microwave-the-chocolate-and-butter-together-for-15-seconds-stir-and-microwave-again girl. Gradually add butter (if you haven’t melted it with the chocolate already) and water to sugar, beating with an electric mixer. Add vanilla, and beat until smooth. If it’s too thick, I add more vanilla. Drizzle artistically over the top. Add homemade or premade sugar flowers as a kind of minimal accent.